Posts The GREAT Chili con Carne Project, Part 2: Chili Conquers the U.S.A. The GREAT Chili con Carne Project, Part 2: Chili Conquers the U.S.A.
Part 2: Chili Conquers the U.S.A.
From its humble origins as various meat and chile concoctions in Mexico, the concept of chili crossed the border and further evolved in the Lone Star State, which now claims the bowl ‘o red as its State Dish. But that was just the beginning. Around this time, commercial chili powder was created, but history is unclear about who actually invented it. Some chili historians credit the invention of the red dust to DeWitt Clinton Pendery of Fort Worth, who began selling his own brand of “Chiltomaline” powder to cafes and hotels in the early 1890s. It was Pendery who noted in his advertising: “The health giving properties of hot chile peppers have no equal. They give tone to the alimentary canal, regulating the functions, giving a natural appetite, and promoting healthy action of the kidneys, skin, and lymphatics.” Pendery’s company, first called The Mexican Chilley Supply Company, later changed its name to Pendery’s, and it’s still open and selling chili powder (and many other spices) today in Fort Worth. Other sources insist that it was William Gebhardt of New Braunfels, Texas, who produced the first packaged chili powder in 1894. Two years before, Gebhardt had opened a café in back of Miller’s Saloon and discovered that chili was the favorite food of his customers. But chili was a seasonal food because homegrown chiles were available only after the summer harvest. Gebhardt solved the problem by importing Mexican ancho chiles so that he could serve the dish year-round. In 1896, Gebhardt opened a factory in San Antonio and was producing five cases of chili powder a week, which he sold from the back of his wagon as he drove through town. He was also an inventor, and eventually patented thirty-seven machines for his factory. By 1899, Gebhardt had received U.S. trademark number 32,329 for his Eagle Chili Powder. The Gebhardt brand is still in existence today. William Gebhardt’s own brand of chili was canned in San Antonio in 1908 (some say 1911), and “chile con carne” was first defined in an American dictionary in 1909, according to Joe Cooper. It was “a Mexican dish consisting of minced red peppers and meat.” Another definition (not in a dictionary) referred to the bowl o’ red as “the devil’s soup,” an allusion to the hot chiles in it. By 1917, Walker’s Red Hot Chile con Carne was being canned in Austin, Texas–note the e in chile. During the following year, Walker’s was producing forty-five thousand cans of chili a day. In 1921, Wolf Brand Chili was being canned in Corsicana, Texas. Indeed. The easterners began serving the chili in strange ways, which, of course, forever earned them the scorn of Texans. One-Way Chili was straight, Cincinnati-style chili. Two-Way was served with spaghetti under the chili. Three-Way added cheese on top. Four-Way added onions to the spaghetti and-cheese chili, and Five-Way added beans to the spaghetti base! The Empress Chili Parlor is still open today, serving the now-traditional Cincinnati chili. Back in Texas, the chili queens were banned from selling in San Antonio in 1937 for health reasons–public officials objected to flies and poorly washed dishes. They were restored by Mayor Maury Maverick (a real name, folks–unbranded cattle were named after his dad) in 1939, but their stands were closed again shortly after the start of World War II. The Texans, however, never forgot their culinary heritage, and in 1977 the Texas Legislature proclaimed chili con carne to be the “Official Texas State Dish.” Incidentally, in 1993, the Illinois State Senate passed a resolution proclaiming that Illinois was to be the “Chilli [sic] Capital of the Civilized World,” a move that outraged Texans. During the 1980s, San Antonio began staging what they call “historic re-enactments” of the chili queens, complete with some of the original queens, such as songstress Lydia Mendoza, who serenaded the chili eaters. The “Return of the Chili Queens Festival,” held each year in Market Square, recreates the era of the chili queens and celebrates the dish that, no matter what its origin, will live forever in the hearts, minds, and stomachs of Texans. Since the Chili Bill’s introduction, however, it has been simmering on Congress’ back burner and has never been passed into law. But loyal chili fans try year after year with national publicity campaigns in hopes of getting the bill passed. In 1988, a campaign led by self-proclaimed World Chili Ambassador Ormly Gumfudgin–and supported by the International Chili Society and Maximum Strength Pepto-Bismol–attempted to obtain the signatures of one million chiliheads on a petition to support passage of the bill, which had stalled in the House for four years. Because more than 750,000 people attend chili cook-offs each year, Gumfudgin believed that the goal was obtainable. The goal was not achieved, however, but the bill continued its long stewing in the House of Representatives. Another publicity stunt was staged in 1993, when the International Chili Society and Hyundai Motor America co-sponsored the twenty-three-city “Chili Across America” tour. That motorcade, led by a motorized stagecoach with a three-hundred-pound copper chili pot mounted on top, was designed to begin at the Capitol building in Washington. The final stop in the tour, appropriately enough, was the ICS World Championship Chili Cook-Off in Reno, with its $25,000 grand prize. It seems likely that the cantankerousness of Congress will match that of chili cooks all over the country, and that a final decision on our national dish will come long after this series is published. Meanwhile, on January 23, 1993, a record crowd of thirty-five thousand chiliheads showed up in Greenway Plaza Park in Houston for the ninth annual Houston Post Go Texan Roundup Chili Cook-Off. And that was a local contest. So the public support for chili simply will not evaporate. The recipes that follow reveal the developments of chili con carne, from jails to the chili historians–and the nearly infinite combinations of ingredients and amounts. And we just had to throw in the funniest, most fanciful chili recipe ever created: Whale Chili. Fry the suet in a heavy kettle. Add the meat, garlic, and seasonings; cover. Cook slowly for 4 hours, stirring occasionally. Add the water and continue cooking until the chili has thickened slightly, about 1 hour. Serve plain or mixed with an equal portion of cooked pink or red beans. Chili historian Everett Lee DeGolyer was the owner of The Saturday Review of Literature, and was also, according to H. Allen Smith, “a world traveler, a gourmet, and the Solomon of the chili bowl.” Here is the historian’s recipe in his own words. Brown the garlic and onion in the fat, add meat, and cook until gray (not brown) in color. Add 2 cups of water and let simmer 1 hour. Take pods of dried chile, wash, stem, and remove seeds. Put to boil in cold water and boil slowly until the skins slip easily, usually 45 minutes. Rub the pulp through a colander or sieve to make a smooth paste. You should now have ½ to 3/4 cup of pulp. Chile powder, prepared commercially, may be substituted for the pulp at the equivalent of one heaping tablespoon of chile powder for 2 pods of chile. Rub comino seeds and oregano to a powder, toasting if need be. Add chile pulp, comino, oregano, and salt to the meat and cook slowly for 1 hour. From the famous iconoclast and author of The Great Chili Confrontation, here’s the recipe that infuriated Texans after it was published in Holiday Magazine in 1967. Smith had the gall to title his article “Nobody Knows More About Chili Than I Do.” Once again, the directions are in Smith’s own words. Get 3 pounds of chuck, coarse ground. Brown it in an iron kettle. (If you don’t have an iron kettle you are not civilized. Go out and get one.) Chop two or three medium-sized onions and one bell pepper and add to the browned meat. Crush or mince one or two cloves of garlic and throw it into the pot, then add about a half a teaspoon of oregano and a quarter teaspoon of cumin seed. Now add two small cans of tomato paste; if you prefer canned tomatoes or fresh tomatoes, put them through a colander. Add about a quart of water. Salt liberally and grind in some black pepper, and, for a starter, two or three tablespoons of chile powder. (Some of us use chile pods, but chile powder is just as good.) Simmer for an hour and a half or longer, then add your beans. Pinto beans are best, but if they are not available, canned kidney beans will do–two 15-17 oz. cans will be adequate. Simmer another half hour. Throughout the cooking, do some tasting from time to time and, as the Gourmet Cookbook puts it, “correct seasoning.” When you’ve got it right let it set for several hours. Later, you may heat it up as much as you want, and put the remainder in the refrigerator. It will taste better the second day, still better the third, and absolutely superb the fourth. You can’t even begin to imagine the delights in store for you one week later. Nowadays it’s easy to re-create the chili that Wick used in the first cook-off against H. Allen Smith–just buy some of the famous Wick Fowler 2-Alarm Chili Mix. 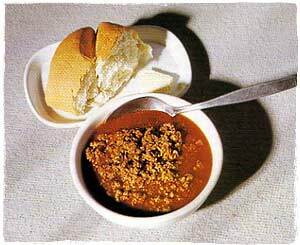 Or, you can follow the recipe below, which chili legend holds is Wick’s original version that he cooked in Terlingua in 1967. Remember to remove the Japanese chiles and the chilipiquins before serving. If this chili is too hot, Wick recommended drinking a pint of buttermilk. Sear the meat in a large skillet until gray in color. Transfer the meat to a chili pot, along with the tomato sauce and enough water to cover the meat about ½ inch, mixing well. Stir in the Tabasco, chili powder, oregano, cumin, onions, garlic, salt, cayenne, and paprika. Add the Japanese chiles and chilipiquins, taking care not to break them open. Let simmer for 1 hour and 45 minutes, stirring gently at intervals. When the olive oil is hot, in a 6-quart pot, add meat and sear over high heat; stir constantly until gray–not brown. It then will have the consistency of whole-grain hominy. Add 1 quart water and cook (covered) at bubbling simmer 1½ to 2 hours. Then add all ingredients, except thickening (flour and corn meal). Cook 30 minutes longer at same bubbling simmer. Further cooking will damage some of the spice flavors. Skim off the fat. Now add thickening, previously mixed in some cold water. Cook 5 minutes to determine if more water is necessary (likely) for your desired consistency. Stir to prevent sticking after thickening is added. A fairly hot chili. Combine the chuck steak and the water and simmer for 30 minutes. Add the remaining ingredients except the flour mixed with water and simmer for 3 hours. Add the flour mixed with water, bring to a boil, and cook for 5 minutes. Remove from the heat and serve. Dig a bowl in the ice 40 feet long, 20 feet wide, and 10 feet deep. Place all ingredients in the ice bowl and mix well with dull ulus. Add water and fumarole-heated stones until the ice bowl is bubbling. Reduce heat and simmer for 2 weeks. Ladle leftovers into 5-gallon leather buckets and freeze in a glacier.